More than fifty thousand copies of this "Story of the Morning Star" were scattered in 1866, the year in which the children made their great offering for building the vessel. The pamphlet has long been out of print, yet it is still called for. It is now reissued, without change in the stereotype plates, but with a sequel bringing the record down to the present time. May the children, and the men and women who, when they were children, became stockholders in the Morning Star, still follow with their sympathies, prayers, and gifts, their missionary ship! THE "Children's Ship," after she had sailed prosperously for ten years, as described in the preceding "Story," became so worn that it was deemed best to dispose of her and build another vessel better adapted to the work among the islands of the Pacific. She was therefore sold at the Sandwich Islands and after taking another name, the Harriet Newell, she went to sea and was never heard from again. The dear old name of Morning Star was kept for the new ship which, in May, 1866, the children were asked to build. Aside from a multitude of individuals, two thousand Sunday-schools cheerfully responded to the call. It. was supposed that, in addition to the money received for the old Star, about $13,000 would be needed, and it was proposed to devote all gifts beyond this sum to a fund to be used in keeping the vessel in repair. By September of that year the offerings for this purpose amounted to over $24,000, and sums kept coming in for two years, until the whole amount contributed was $28,696.37. The vessel was built at East Boston, and sailed on November 13, 1866, under command of Rev. Hiram Bingham, the Micronesian missionary who wrote the preceding story of the first Morning Star. Mr. Bingham proved his fitness for the task committed to him, by bringing the new Star safely around Cape Horn and into Honolulu Harbor on March 15, 1867, after a very short passage of 122 days. Two thousand Hawaiian Sunday-school children marched to the wharf to see "their ship"; for three or four thousand out of one hundred and fifty thousand of her stockholders were Hawaiians. It was on March 28, 1867, that the Star began her missionary work in the Pacific, still sailing under command of Captain Bingham. The plan for her yearly trip is to go from Honolulu first to the Gilbert Islands, although they are the southernmost group, lying directly under the equator. This is in order to take advantage of prevailing winds and currents. Then she sails northwest nearly a thousand miles to Ponape, taking the other mission islands on the way. Since Micronesia began to have foreign missions of her own, the Star has gone from Ponape to the Mortlocks, and the missionaries wish she had time to go still further. Often the loved and longed-for ship has to wait becalmed, miles out from the anchorage, drifting about helplessly under the tropical sun. This sadly delays her work. In one of her "reports" to her youthful owners, the Star says: "I came down flying from Ponape  I am going back 'wallowing.' I am doing the very best I can, and am glad no one complains at my slow progress. The only approach to complaint is the natural remark, which rather mortifies me: 'Now is the time for a steamer, O, for the power of steam!' Well, I am sorry, and would gladly do better. I am thinking of the dear ones at Ponape and Ebon, waiting for my return." On coming back to Honolulu this year, 1867, the Star took, Mrs. Snow and her children on their homeward way to America, leaving Mr. Snow alone at Ebon. Mrs. Snow had been sixteen years absent from her native land. Ponape was then reported as having nine meeting-houses, six or seven hundred readers, and 176 church members. The whole number of converts on all the islands that year was 144; from the first, 459; and foundations had been laid for yet more glorious things. In 1865, Captain Bingham's health obliged him to give up the command of the Star. It was arranged that he should go down yearly to the Gilbert Islands, to give counsel and assistance, but: spend the rest of the year at Honolulu, translating the Bible and preparing other books for the natives. THE MORNING STAR IS WRECKED. The little ship kept on her way prosperously until October 18, 1869. That day, having finished her Micronesian work for the year, she left Kusaie for Honolulu. Messrs. Snow and Sturges were on board for their return to America, and all were in buoyant spirits. At evening prayer they joyfully sang "Homeward Bound," but the Captain found when he went on deck after supper that the Star had been working in towards the island and was dangerously near the reef. She had got into a strong current. Boats were lowered and began towing her off shore. An anchor was let go in twenty fathoms of water and held her till a severe squall came up. Preparations had been made to slip the cable, in case the wind should favor, and try to shoot out clear of the reef with the fore and aft sails. But in trying to effect this after the squall, instead of shooting ahead, she only sagged off and soon struck the reef, broadside on. The surf was heavy, the shore rocky, and all hope for the vessel was gone. The missionaries and all on board got safely to land in a boat, though with great peril of their lives; they also saved some of their effects and the ship's chronometers and charts. After a long month of waiting, they took passage in the Annie Porter and reached Honolulu, February 8, 1870. When the news of the wreck of the Star reached America, her young owners were invited to give $10,000 towards replacing her. Her insurance was $13,000. Mrs. Sturges wrote a letter asking "all the bright-eyed, generous boys and girls," to gather up their pennies and pour out the contents of their banks. "At this holiday season," she said, "when you are all wanting to make Christmas and New Year's presents, you have use for all your money. But will not this missionary ship be a noble New Year's gift to all of us  your uncles and aunts, and thousands of dark-skinned cousins off in the wide Pacific?" The children again responded to the call and a new Morning Star was begun at East Boston. But even under the efficient supervision of the Hon. Alpheus Hardy, it takes time to build a ship. So, in 1870, there was no beautiful Star to visit the far-off isles, bearing life, and comfort, and joy. The ship Annie took down supplies for the Hawaiian teachers and for Mr. Doane, and brought back Mr. and Mrs. Bingham, who had gone to Apaiang in the United States ship Jamestown. Mr. Doane was the only American missionary in Micronesia for a part of that year. Yet, alone on Ponape, the Lord gave him unusual joy and success in his work, the Divine Spirit working with him, so that at every communion he received new Christians to the church  one hundred in all. Meanwhile, a strong and beautiful but plain ship was finished at East Boston, and sailed on February 27, 1877, under the command of Captain Matthews, for Honolulu. There the returning missionaries, Mr. and Mrs. Snow, Mr. and Mrs. Sturges, Mrs. Doane, and Mr. and Mrs. Bingham, with Mr. and Mrs. Whitney as reinforcements, were awaiting her. They had arrived, via San Francisco, the morning of July 3d, and the Star came booming around into Honolulu Harbor, with the flags flying and all sails set, that very afternoon! One can imagine the delight of the missionaries. They hastened on board. Mr. Snow wrote: "After trying our voices and our hearts in 'The Morning Light is Breaking,' Mr. Sturges proposed that our thanks be offered in humble prayer to the kind Preserver; in which Brother Bingham led us, renewedly consecrating the dear vessel to her blessed work of love and mercy among the islands. She is pronounced a success. How joyously all we Micronesians take her to our hearts! Precious treasure for our beloved work. God bless her, and her thousands of owners! How often the expression is heard, 'How like the one that we lost! It almost seems as if she had risen from her watery grave!'" And so, in the summer of 1871, a third Morning Star dawned on the waiting isles. We who have never known such isolation as Mr. Doane's cannot conceive with what feelings he wrote: "The Morning Star reached us on the 13th of September, bringing me Mrs. Doane. How can I thank the Master of all for his care over her! and how can I thank sufficiently the dear children at home for building the new ship, fitting her up so beautifully and sending her forth on her errand of mercy! And I trust our young friends will not think they can send anything too beautiful to help advance our Saviour's cause. He himself is the One altogether lovely. Let me thank the children for this gift, and beg for one other  that they will give themselves to Jesus to be his soldiers, and to plant his banner on many a wild, heathen shore." The next year, 1872, the 27th of August had dawned upon Ebon when Mr. Snow wrote: "Not a word from home since we left San Francisco, in June of last year, until yesterday, when the Narragansett brought American papers. We shall get accustomed to delays in our mail department, one of these days or years, perhaps, so that we shall be more patient. But those dear children! the parental heart cannot well restrain the yearning for some word to break the long silence, that we may at least know whether they yet live. We are trying to learn yet more of that 'Like as a Father,' and of the blessing those receive who not having seen have yet believed." But the Star came at last and brought good news, and found the good work going on. From year to year the joy of Christ and his salvation had been spreading among the Gilbert and the Marshall Islands. And natives of Ponape had been in training to become themselves missionaries, to the isles beyond. Indeed, two Ponape teachers had been placed on Mokil, and an effort made, in 1871, to land a couple on Pingelap, but the king refused them admission. A white man had hired him to exclude missionaries for ten years, fearing that his wicked deeds would be hindered or reproved. However, two Pingelap people had strayed away to Ponape, and there heard the glorious tidings of God and their Saviour. They believed and accepted the truth, went home to Pingelap, and induced their people to throw away every idol. The whole population joined in building the largest church in Micronesia and also a large school-house, where they all gathered for instruction. They were waiting for missionaries. MISSIONS OF THE PONAPE BOARD. In 1873, the Star went on to Mokil and found the whole adult population waiting to be baptized! At Pingelap she was welcomed by a thousand people, with every demonstration of joy. "I could not restrain the flow of tears," wrote Mr. Sturges of this scene, "as I saw such a mass of humanity, very many with long beards white as the driven snow, and as many as four hundred children seated so prettily before the stand, and all so orderly. I had to explain the cause of my tears. I told them I was thinking of their sending me away two years ago. Then I wept in grief for them; now it was joy. They said, 'We did not know then; now we know.' And they promised to feed the Ponape teachers the Star had brought for them, and be father and mother, brothers and sisters, to them. 'We all will make them ours,' said they." 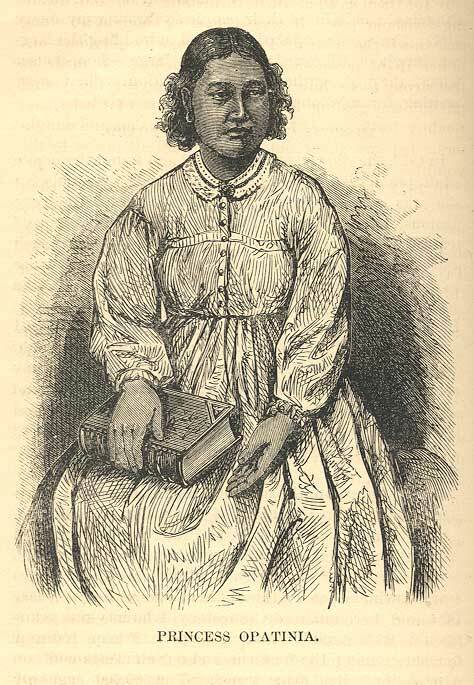 On the same trip, the missionaries settled on the Mortlock Islands three couples of their Ponape children, among whom was the beloved Princess Opatinia, with her husband Opataia. After returning to Ponape, Mr. Sturges wrote: "Home again, with hearts full of promise to Him who has so kindly watched over us and our dear Morning Star, and, more especially, who has granted us open doors to such interesting people. Ponape has now teachers among the heathen, and our churches will feel a new life." Mr. Doane wrote: "The teachers had only to knock; none were refused; the natives promising to care for them as their own, furnishing food and dwellings without pay. It was a cheering thought all along that this is the year of Ponape's majority-twenty-one in her life of possessing Christian teachers. It made us feel strong to see how in this majority-year the young mission was girding herself for the work of Christ, and sending forth some of her most chosen sons and daughters. Let me shout out, All hail and all praise to the youthful builders of the Morning Star!" In 1874, three new American missionaries, with their wives, gladdened the hearts of the lone workers in Micronesia. 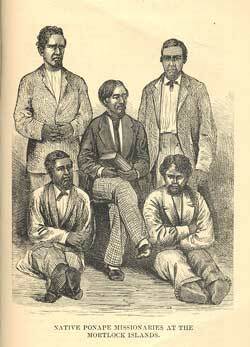 Mr. and Mrs. Taylor were stationed at Apaiang, and Messrs. Logan and Rand at Ponape. But alas! Mrs. Taylor lived only a few weeks. At Pingelap a vast throng of people greeted the Star, and Messrs. Sturges and Doane organized a church of seven members, at Satoan, Mortlock Islands. Opataia and "his queen-wife, looking every bit a queen," awaited them on the beach, and led them to their tidy and home-like house. All the three Ponape teachers had learned the new language of their islands. and had good meeting-houses and attentive congregations. "It seemed more like a. dream than a reality," wrote the missionaries. "to find our spiritual children, so recently boys and girls in the filth of heathenism, now these men and women, all appearing well and more than happy in their high calling as messengers of Christ." Mr. Doane went to Honolulu in the Star that year, 1874, and there reported the results of twenty-one years labor in Micronesia. "Four dialects had been reduced to writing and into all of them the New Testament, or portions of it, had been translated; 2,500,000 pages of school-books and of the Scriptures had been printed. There were three training-schools, and twenty churches with a membership of one thousand, giving forty-five conversions for each year of labor. These churches had sent forth ten native teachers, and, in 1874, had contributed nearly a thousand dollars at the Monthly Concerts." In 1875, there were three churches of thirty-eight communicants organized at the Mortlock Islands, and at Pingelap one hundred and six members were received to the church. In 1876, still greater things were done by these Ponape Foreign Missions. The Mortlock Christians received the missionary visitors and the Star with overflowing ,joy. Four more churches were established, making seven in all, with an aggregate of two hundred and ninety-eight members, and not one of the converts baptized by the missionaries the year before had died, not one had gone astray, and every one had abandoned his pipe! At Pingelap "two hundred candidates were waiting to be received into the fold." A glorious day seemed dawning throughout Micronesia. Eight more churches were organized a among the islands in 1877, and over five hundred new members were received. Of the four hundred people at Kusaie, one hundred were church members. At Oniop, Mortlocks, the young church parted with its beloved teachers, given them only a year before, in answer to loud calls from heathen islands beyond. At first the people argued against this and discussed it till ten o'clock at night. Then they separated, all agreeing to pray much through the night to Christ for light. Next morning they met by themselves, and soon sent a note to Mr. Sturges, which read thus: "Are the teachers ours that we should hold on to them? They belong to Jesus. If he wants them we would not keep them." These islanders had followed the Star, the year before, day after day in their canoes, pleading for teachers; had built them a model parsonage, and had most lovingly cared for and fed them. But the Gospel light they had received taught them to make sacrifices for those still in darkness. In 1878, Captain Isaiah Bray took command of the Morning Star, and she visited twenty-five islands. 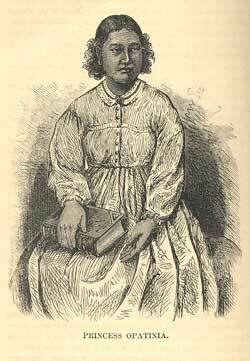 Again native teachers were removed from weeping, yet consenting, churches to heathen islands beyond. At one new island the people held up both hands in token that they would protect and support teachers; "keeping their lands up, seeming to think that the longer they held them up the surer they were of getting the teachers." Hundreds of natives rushed into the water and literally carried the Star's boat to dry land. The additions to Micronesian churches, reported in January, 1880, were four hundred and forty-eight; in 1881, eight hundred and twelve. The Star has extended her trips to the great Ruk lagoon. Wonderful progress, amid various reverses, toils, hardships, and wearing delays, has continued to be the law of the mission life. Dr. and Mrs. Pease, and Mr. and Mrs. Walkup, have been added to the corps of laborers, and from time to time missionaries have, for various reasons, been withdrawn. The second Mrs. Taylor and the beloved veteran Mr. Snow have laid down the blessed work for the glorious rest. After Mr. Snow's death his faithful wife and fellow-worker returned to her solitary Kusaiean home, accompanied by Miss Cathcart, but illness soon obliged her to retire. In 1882, Mr. Sturges, who had been in America on account of ill-health, returned to Ponape, although Mrs. Sturges was unable to accompany him. Rev. Mr. and Mrs. Houston and Miss Fletcher went with him. Mr. Doane remains at his post. 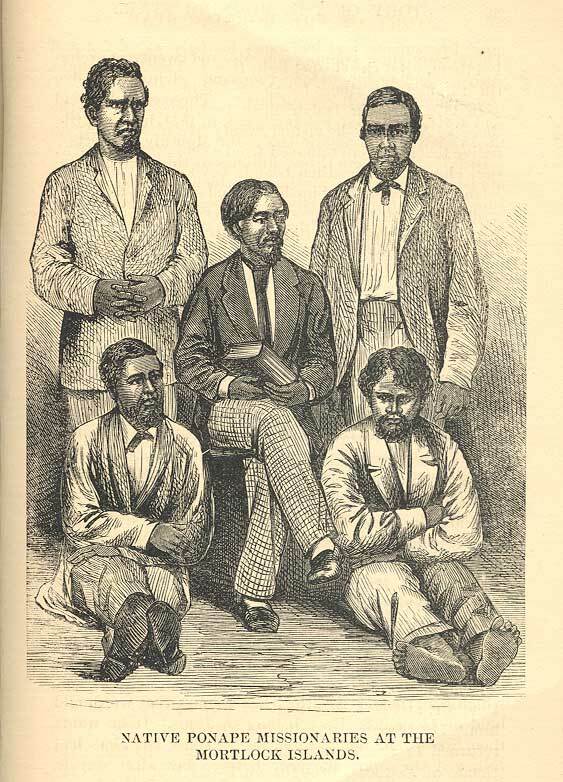 Mr. Logan returned to this country in 1882, after a fearful experience of sickness, brought on by lack of proper food at the Mortlocks, and of delays in reaching Auckland by a little trading-vessel. It was thought he would die if he waited for the coming of the Morning Star. Indeed the Star's long delays, in consequence of calms and contrary winds and currents, have been all along a trying and a dangerous thing for the missionaries. The increasing work at new islands is also too great to be done in time to allow the Star to return to Honolulu and be back again the next year with supplies. The missionaries are eager for a steamer and their friends desire it as earnestly. But the expense of procuring and maintaining a steamer is very great. The present vessel is a brig, 98 feet long, with breadth of beam 20 feet, and measuring 181 tons. During her trip last year the Star had, besides her captain and two mates, a crew of eight men, seven of them Hawaiians and one a Caroline Islander. The cook and steward were both Chinamen. Excepting these Chinamen, all were professed Christian men. This year (1883) a compromise has been decided on for the present. A steam-launch is to be provided, to be carried ordinarily on the deck of the Morning Star; and to be taken out for towing the vessel into lagoons, for landing passengers and supplies, and also in case of calms, or when the ship is in danger of drifting upon the reefs. Before long the Star will be worn out. She may then be replaced by a ship with sails and also with auxiliary steam, and of sufficient capacity to do all needed work more thoroughly than has been possible hitherto. HOW IT LOOKS TO THE MISSIONARIES. An honored missionary lady writes feelingly of the need of such additional facilities: "The present Morning Star has reached the limit to which she can go. The dark islands beyond Ruk are calling; must we turn a deaf ear to their cries for light? Must the work of the Lord there be thus crippled and hampered, and done in the slow way of a hundred years ago, in this age of science, and steam, and telegraphy, and when, in Christian America, men everywhere in the world's business have all the appliances for convenience and speed which wealth can furnish? Are men more plenty than money? Is it easy to find those who are ready to go to that most isolated field; where mail and supplies come but once a year? And should not those who remain at home see to it that their representatives out on these far-away picket-posts are supplied with every means to make their work effective and with that which will minister to their health and comfort? I confess, too, that what I have seen and felt moves me in this matter. In a voyage to Micronesia I have endured a thirty day's calm. While we were living at the Mortlock Islands my husband was prostrated by overwork and insufficient food, and there was less than half a loaf of bread between us and hunger, and this because the Morning Star was delayed by calm in getting to us with supplies. Later we took a weary, seasick voyage of fifteen days which, with a limited supply of steam, might easily have been accomplished, in four days. Still later, we had another long and dreary voyage of seventy-nine days: days full of discomfort and of anxiety, and of peril to at least one life: days in which I saw my children look with eager, hungry eyes for nourishing food which they could not have, and turned away to hide my tears. It is not easy to speak of all this. Missionaries do not commonly bring to the front their trials and privations; nor would I, but for the needs of the cause in Micronesia. I bring this before you because I believe that Christians at home will act upon it when they understand it." Will not the churches and the children justify this confidence, and be ready in due time to build a vessel with steam-power attached, to carry the messengers of life to the islands of the Pacific?